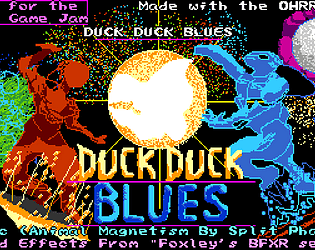 I cry about how difficult is to develop games, and lash out at consumer culture that has created an oversaturated market of hyper-violent and hyper-realistic games, and ducks convey the thoughts of the developer to the player.... i forget the rest. Music: Split Phase - "Animal Magnetism"
EDIT: V1.1 where you can dash without stopping and walk over chicks to add them to your party is now available. Sorry for any inconvenience! Seems there is a problem with a monster walking on water. Wasn't able to actually collect any of the ducks. Not sure if that was a bug, misunderstanding on my part, or intentional part of the meta. But the art was nice and the commentary amusing. I had a bit of trouble figuring out what to do. I could move around, but it was hard to tell where to go or what the goal was. I like the look of the game though, and it seems like you have some great meta ideas! Call me inept but I had a really hard time figuring out what to do, I know there's a readme but I'm way to lazy right now to do that... Sorry. I may come back to this as I like the concept! The ducks!